The hills are alive with the sound of speed. It’s race day at Lime Rock Park, deep in rural Connecticut. The beastly roar of Corvette V8s mixes with the alien buzz of Ford’s twin-turbocharged V6 GTs, the whine of Porsche flat-sixes and high-revving Ferrari V8s thrown in for good measure. And in the middle of it all are two cars wearing Lexus badges. Lexus has raced before, but most people still associate the Toyota luxury brand’s products more with country clubs and shopping malls than racetracks. So for 2017, Lexus enlisted Michigan-based 3GT Racing to put its cars up against the best the sports-car world has to offer. 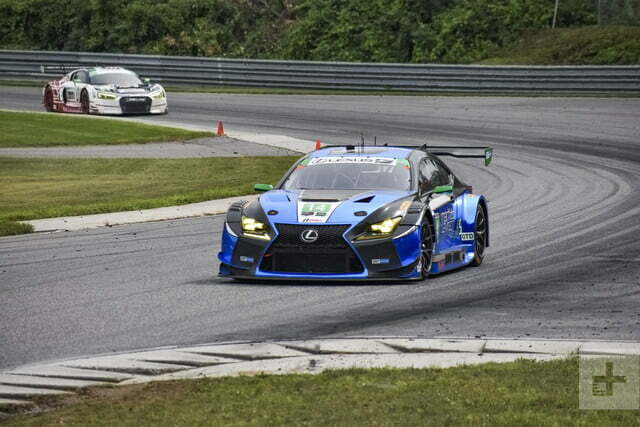 Their weapon of choice is the RC F GT3, a racing version of its RC F coupe. The “GT3” refers to FIA GT3, a class of race cars based on showroom models designed to run in race series across the globe. GT3 is supposed to emphasize commonality with production cars, but the demands of today’s racing environment mean they end up becoming something else entirely. 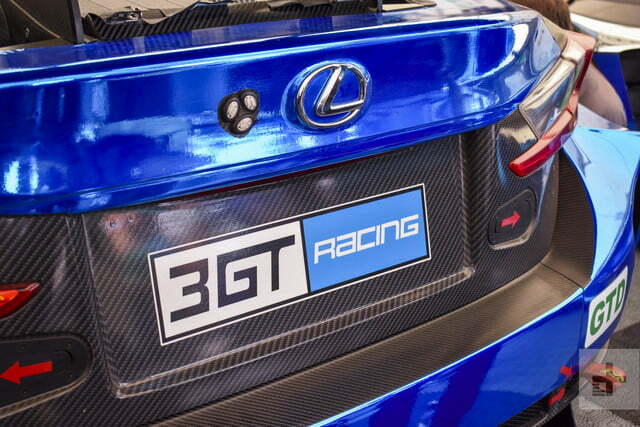 It may have started out as a regular luxury car, but the RC F GT3 is a completely different animal. Inside the 3GT Racing garage, mechanics are making final adjustments on the teams’ pair of RC F GT3s before that afternoon’s race. 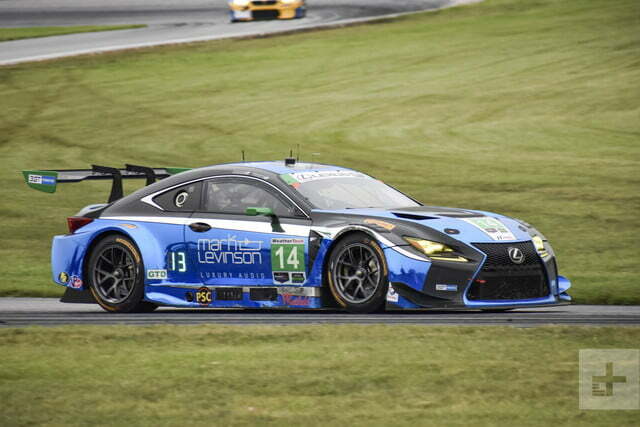 Wearing a mostly blue livery, the cars look like automotive versions of Sonic the Hedgehog. The bodywork bristles with appendages, from spoilers and ductwork, to massive fender flares that enclose upsized wheels and tires. 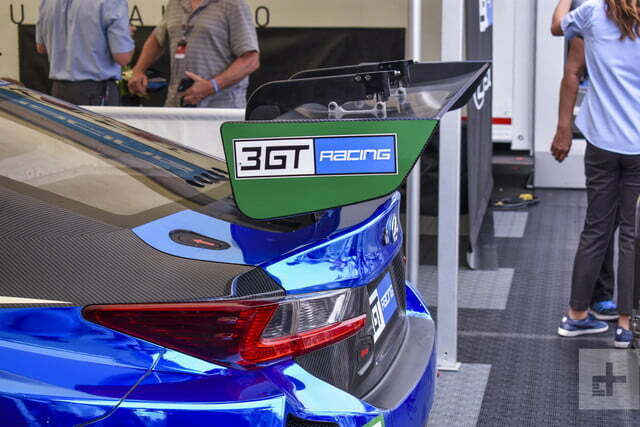 Each RC F GT3 starts out with a stock RC F bodyshell, but from there things get a little more interesting. 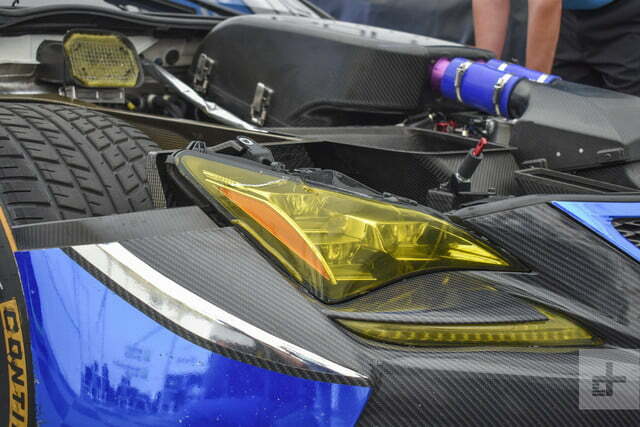 Every visible panel is made from carbon fiber to keep weight down. Lexus also added a massive rear spoiler and rear diffuser, which produce aerodynamic downforce that helps stick the car to the track. Despite looking like a boy racer’s dream, the aerodynamic aids on the RC F and other GT3 cars are actually pretty tame by racing standards. Engineers at the factory could have gone further, and teams aren’t allowed to make any changes of their own. The powers that be wanted to keep costs down, and to make the race cars look as much like their showroom-ready counterparts as possible. 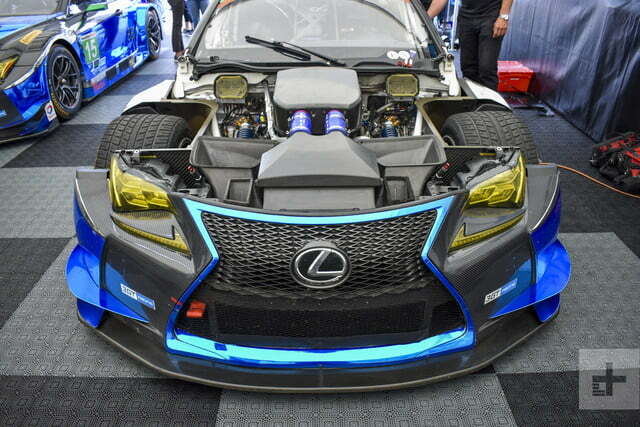 It may have started out as a regular luxury car, but the RC F GT3 is a completely different animal. Affordability and road-car relevance are the whole reason for GT3-type cars. 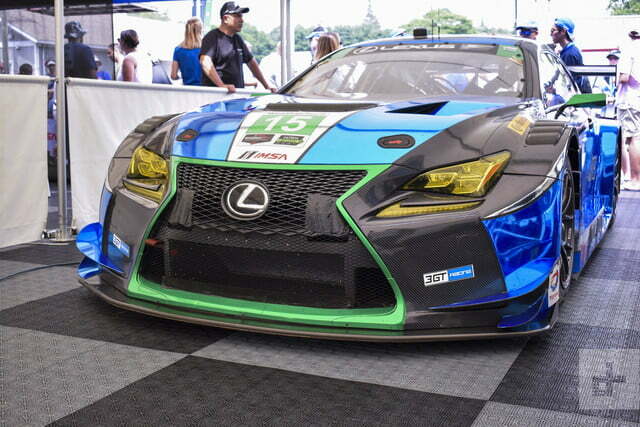 In the U.S., the RC F GT3 races in the IMSA WeatherTech SportsCar Championship, in the series’ GTD (GT Daytona) class. 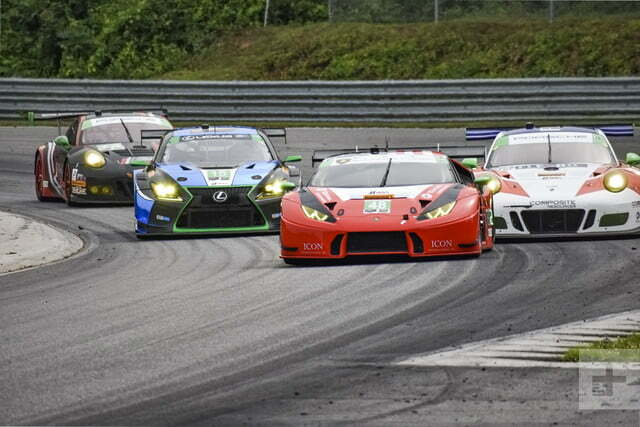 In a series in which up to three classes of cars run at once, the GTD cars are the slowest by design. 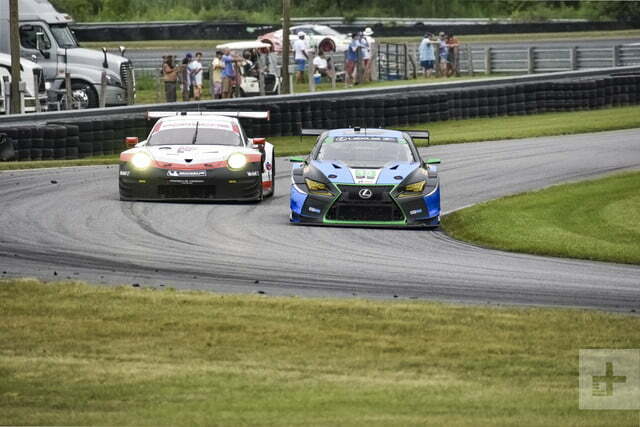 Teams engage in a race within a race, aiming to beat the other GTD entrants rather than take the overall win. But while the cars are slower, they’re also much cheaper to run. On tires alone, GTD teams spend half as much per set as teams running the faster GTLM (GT Le Mans) cars, said 3GT Racing owner Paul Gentilozzi. Peering into the cockpit, you won’t find any of the usual Lexus luxuries. Instead of leather and wood, the interior is almost entirely bare metal. The single seat (no passengers allowed) isn’t exactly the last word in comfort either. It’s meant to hold the driver in place during hard cornering, not to be an armchair. 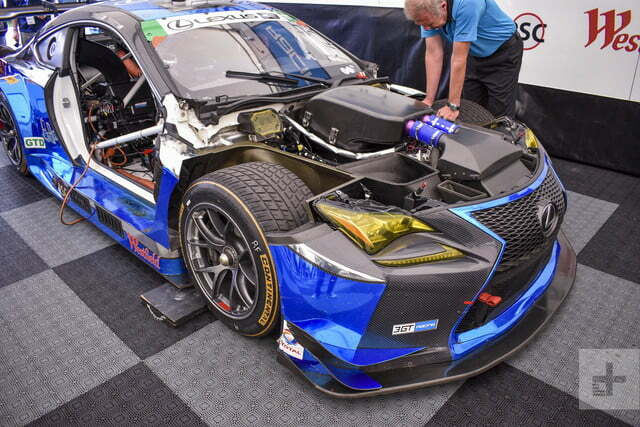 The carbon fiber bodywork and crash diet produce results. The RC F GT3 weighs 2,866 pounds, or about 1,000 pounds less than a stock RC F. In the automotive world, lightness is next to godliness. Shedding weight improves every aspect of a car’s performance, from fuel consumption to handling to acceleration. 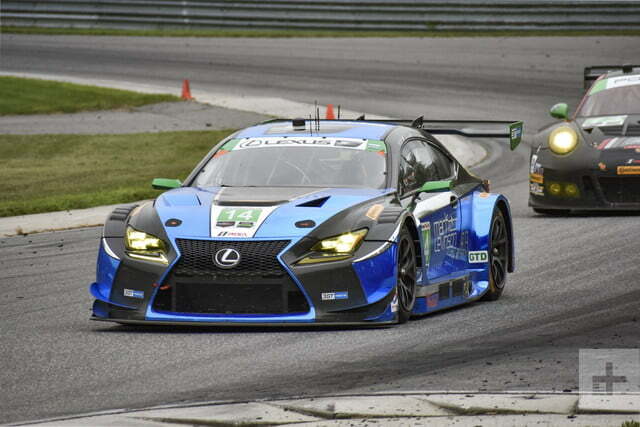 Helping the RC F GT3 in the latter area is a V8 engine punched out from the stock 5.0 liters of displacement to 5.4 liters. 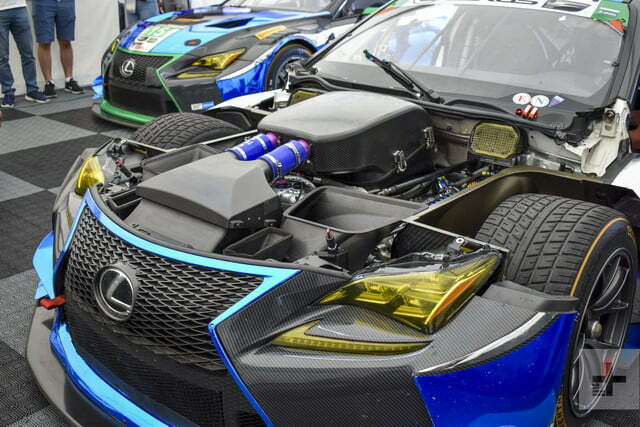 It produces over 500 horsepower, compared to 467 hp for the stock RC F. The stock eight-speed automatic transmission is also ditched in favor of a six-speed sequential racing gearbox. 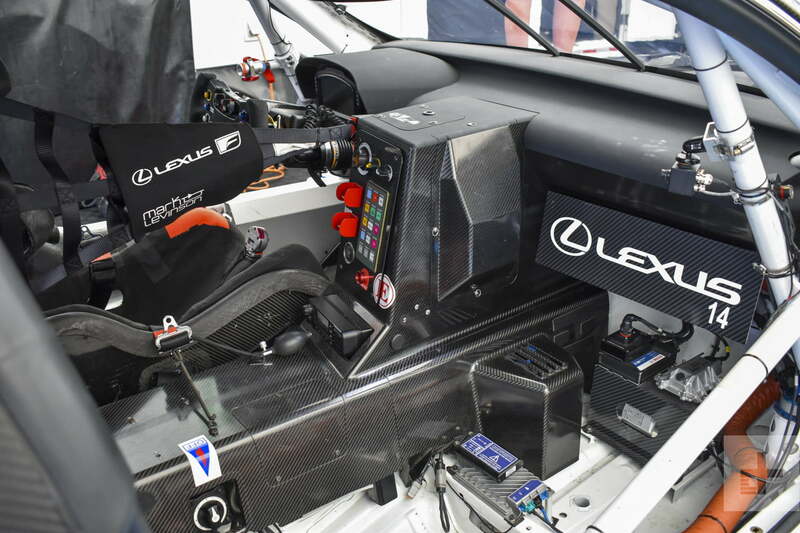 However, the driver changes gears using paddles taken from a production RC F.
Besides the paddle shifters, one thing the race car and the road car have in common is extensive use of electronics. Just like the driver of a stock RC F, the GT3 race car’s driver is confronted with an array of steering-wheel mounted controls. But instead of setting the cruise control or activating Bluetooth, they do things like select different software maps for the engine and transmission, and engage a limiter that keeps the driver from going too fast in the pits. 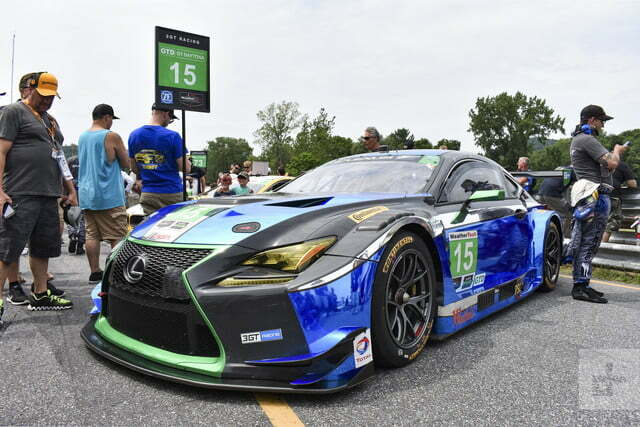 Each car has four CAN bus computer controllers, which send out data over two Ethernet connections, as well as an LTE telemetry system, said John Gentilozzi, 3GT Racing technical director and son of team owner Paul. The team can monitor virtually every aspect of the car from the pits meaning, among other things, that drivers have no excuse when they screw up. In the automotive world, lightness is next to godliness. “You can’t get away with anything,” said Scott Pruett, co-driver of the No. 14 Lexus. “In days gone by, if a driver missed a shift, you’d go ‘I didn’t miss a shift, I didn’t over-rev it.’” Silver-haired and square-jawed, Pruett, 57, looks like a race driver sent from central casting. He’s raced in a number of different series over a career spanning decades, and his resume includes five Rolex 24 at Daytona victories, and numerous other race wins and championships. Pruett misses the “purity” of the days before electronic driver aids and data acquisition, when racing really was just about driver and machine. But he believes the encroachment of technology has been worthwhile because of how it benefits road cars. Technologies like computerized engine management were refined through racing, Pruett said, and that process has helped make modern road cars better. But that technology transfer is very gradual, even when you’re an automaker racing the same car you sell. 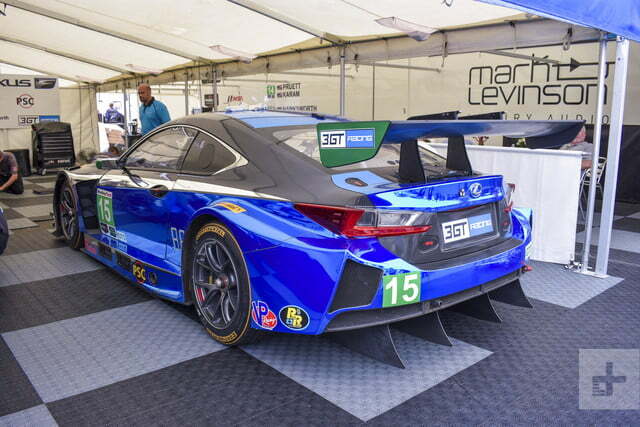 Mark Egger, Lexus motor sports manager, said there is a dialogue between the race program and engineers working on production cars. However, he noted that the pace of automotive development cycles—in which a given model is completely redesigned every four years or so—mean any changes take awhile to show up on cars people can actually buy. 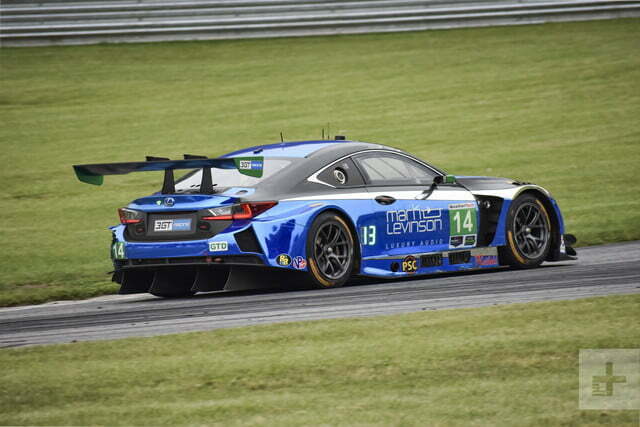 For Lexus, just being seen on track is a big part of the appeal of racing. 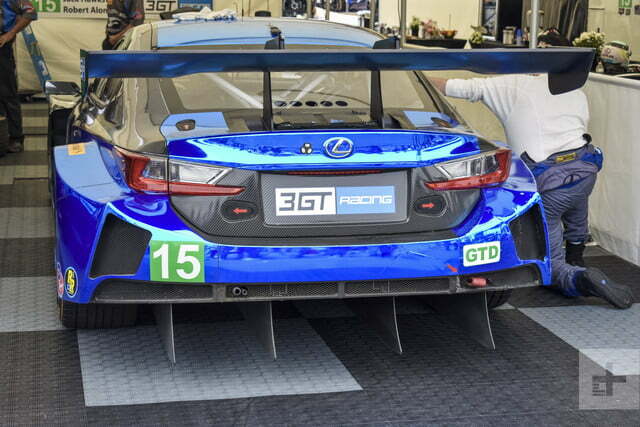 Lexus chose the GT3 category because it wanted to build a race car based on a production model, and the popularity of GT3 allows it enter cars in a number of different series around the world, should it choose to do so. “IMSA has the most premiere tracks in the country,” Egger said of the WeatherTech SportsCar Championship. 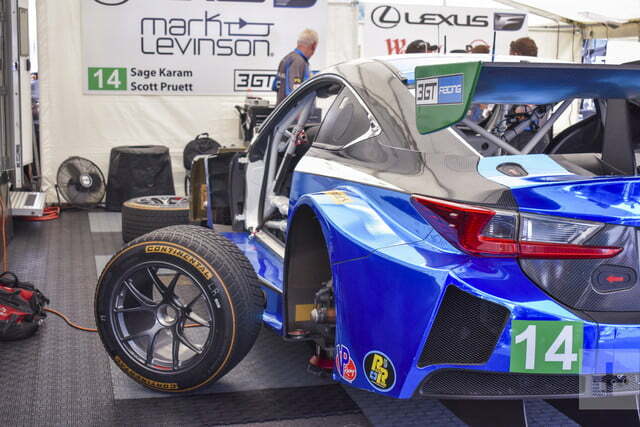 While racing has experienced a decline in popularity, and thus in value to advertisers, it’s still an important platform for automakers trying to emphasize performance, as Lexus is. IMSA’s races—which includes iconic events like the Rolex 24 at Daytona and 12 Hours of Sebring—is something car enthusiasts pay attention to, even if the general public doesn’t. 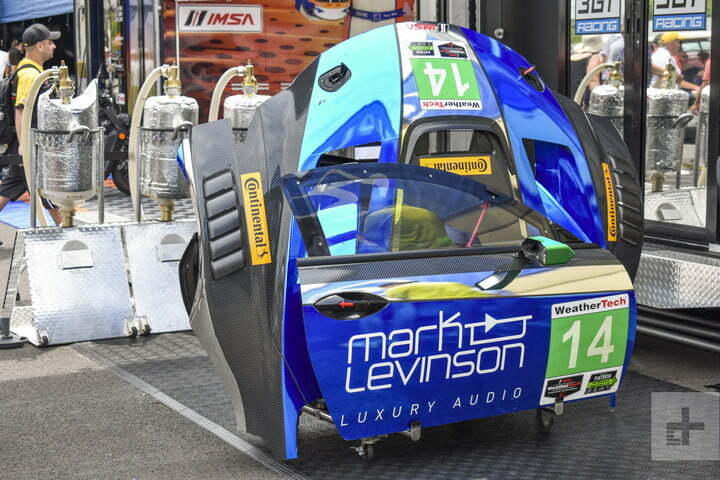 The more automakers are involved in racing, the better it generally is for the fans. 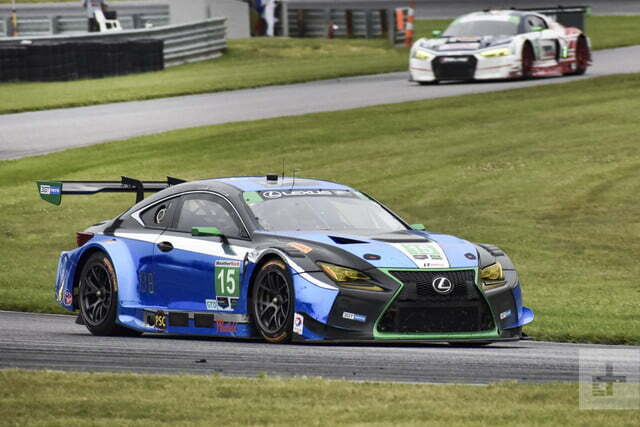 Along with Lexus, the IMSA GTD lineup currently includes the Acura NSX, Audi R8, BMW M6, Ferrari 488, Lamborghini Huracán, Mercedes-AMG GT, and Porsche 911. Different versions of the Bimmer, Ferrari, and Porsche also race in the GTLM class, along with the Chevrolet Corvette and Ford GT. That’s quite a lineup. At best, the average person might typically see one of these high-end cars parked outside the local Starbucks. But racing lets people see them doing what they were built to do—drive fast. All of that sound and fury might even help improve tomorrow’s production cars.